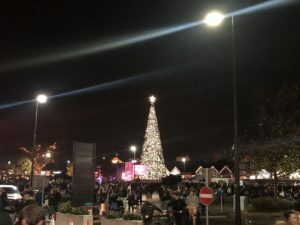 The countdown to the festive period at Cheshire Oaks kicked off last night after treating visitors to its much-anticipated Christmas lights switch-on event. Featuring the return of its walk-in Christmas tree, which is the largest of its kind in Europe, the designer outlet in Ellesmere Port also put on an eight-minute-long musical firework display. More than 100,000 twinkling lights were lit up, after being switched on by special guests, Leanne Campbell and Dave Kelly, from the Radio City Breakfast Show. The event also showcased a live orchestra performance of the iconic ‘Walking in the Air’ song from The Snowman, which celebrated the film’s 40th anniversary since its release. Other festive entertainment included a carol recital from dance theatre school, The Hammond, as well as a solo gig from Britain’s Got Talent 2016 finalist, Beau Dermott. For visitors to immerse themselves in the winter festivities, the Christmas Corner also made a return, featuring German delicacies, an après-themed bar and a decorative carousel. The event is part of a charity partnership with Autism Together, and it is planned that the donations raised from its walk-in Christmas tree, which will be staffed by local volunteers, will go towards helping the charity’s work. Rick Myers, fundraising manager for Autism Together, told JMU Journalism: “Everyone at Autism Together is delighted to be the beneficiary of this year’s Christmas Tree at Cheshire Oaks, particularly as it is our 5oth anniversary. Everything we raise here will go towards our Future 50 Appeal, aiming to raise £2.5 million to help and support those on the autistic spectrum. Echo: Which Merseyside town has the best Christmas lights in 2017?